Hypertension is recognized as an important global public-health challenge. High blood pressure is the foremost controllable risk factor for morbidity and mortality and is a major independent risk factor for the development of coronary artery disease, stroke, and renal failure. The hypertension affected overall, 26.4% of world’s adult population in 2000, and the figure is expected to increase by about 60%; i.e. to 29.2% of total adult population by the year 2025. There are several therapeutic options for the management of hypertension, dependent upon the overall status of disease. The Angiotensin Converting Enzyme (ACE) inhibitors are rated as first-line treatment in the effective management of hypertension. However, the current AEC inhibitors in clinical practice are nonselective inhibitors and thus causing several unwanted effects. Therefore, new selective inhibitors have been focused around the world by various researchers for the discovery safer agents. The phytopharmaceuticals such as alkaloids have a marvelous therapeutic history and numerous alkaloids are in clinical use, therefore it could be an ideal approach to study for the design of selective inhibitors. This review encountered the so far tested alkaloids and their significant results thus suggested further study of these and many, more alkaloids for the discovery of new effective and selective ACE inhibitors. Furthermore, the application of modern pharmaceutical technologies could be helpful in the effective design of agents. Keywords: Phytoalkaloids, ACE inhibition, preclinical status, drugs of future/selective inhibition, alkaloids, hypertension. Keywords:Phytoalkaloids, ACE inhibition, preclinical status, drugs of future/selective inhibition, alkaloids, hypertension. Abstract:Hypertension is recognized as an important global public-health challenge. High blood pressure is the foremost controllable risk factor for morbidity and mortality and is a major independent risk factor for the development of coronary artery disease, stroke, and renal failure. The hypertension affected overall, 26.4% of world’s adult population in 2000, and the figure is expected to increase by about 60%; i.e. to 29.2% of total adult population by the year 2025. There are several therapeutic options for the management of hypertension, dependent upon the overall status of disease. The Angiotensin Converting Enzyme (ACE) inhibitors are rated as first-line treatment in the effective management of hypertension. However, the current AEC inhibitors in clinical practice are nonselective inhibitors and thus causing several unwanted effects. Therefore, new selective inhibitors have been focused around the world by various researchers for the discovery safer agents. The phytopharmaceuticals such as alkaloids have a marvelous therapeutic history and numerous alkaloids are in clinical use, therefore it could be an ideal approach to study for the design of selective inhibitors. 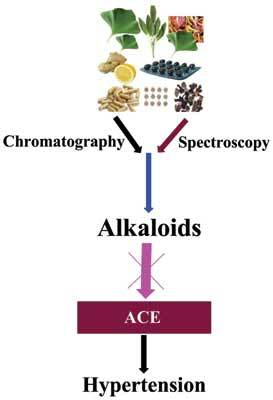 This review encountered the so far tested alkaloids and their significant results thus suggested further study of these and many, more alkaloids for the discovery of new effective and selective ACE inhibitors. Furthermore, the application of modern pharmaceutical technologies could be helpful in the effective design of agents.